The first side of Desolation Boulevard (actually a compilation from two English LPs) is devoted to material written by producers Mike Chapman and Nicky Chinn -- five reasonably timed, concise and overwhelmingly direct assaults on the senses. The song structures are played with almost military precision with an emphasis on repeated guitar riffs and catchy hook lines. The production is designed to capture the electricity and raw energy of live performances, succeeding quite well in conveying a sense of explosive immediacy during the proceedings. The lyric content mimics some of Peter Townshend's finest mid-Sixties moments, displaying a remarkable lack of self-consciousness during humorous numbers like "A.C.D.C." (the story of a bisexual girlfriend) and "I Wanna Be Committed." The effect is not unlike The Who Sings "My Generation" recorded on sophisticated Seventies machinery. 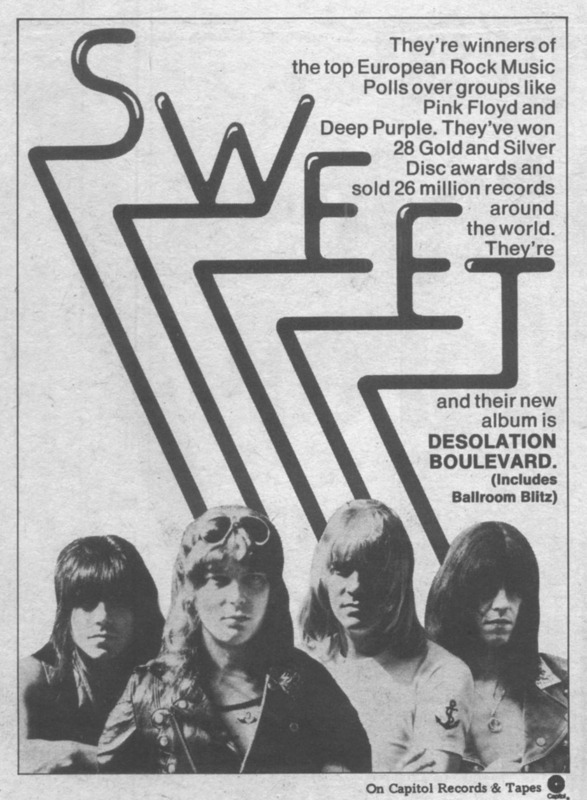 Side two is devoted to Sweet's own compositions, reinforcing their tag of "a bubblegum Led Zeppelin." Guitarist Andy Scott is given much more freedom in the band's lengthier, more experimental format, bending his axe into bizarre contortions à la the Yardbirds-era Jeff Beck on "Sweet F.A.," riffing out submachine gun riffs on "Set Me Free" and using intervals to create a full, forceful and effective solo on "Into the Night." Were the Yardbirds alive today with no change in their musical direction, I'm almost certain this side of Desolation Boulevard is what they'd sound like. The Sweet has combined two divergent musical styles -- the tight, restricted control of Chapman and Chinn and the guitar-based experimentalism of their own compositions -- into an explosive package. Desolation Boulevard is decidedly English in tone, decidedly hard rock in approach, and to these ears a decided success from a band with a future a mile long. - Gordon Fletcher, Rolling Stone, 7/31/75. 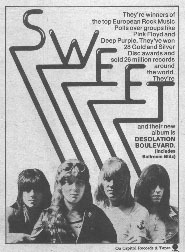 For the past several years the Sweet have been one of Britain's most consistent hit makers, yet they have been a group plagued with a "teenybopper" image. This set signals a change of direction for the band, with all members taking an active part in writing material for the first time and the songs taking a fuller approach instrumentally and a more mature approach vocally. Production quality is more American (most British top 10 acts rely on a tinny sound) than on previous product, and the result is 10 solid pop/rock cuts. AM hits are possible, and this is the first real chance the group has ever had for FM play. New approach to vocals, too, with harmonies playing a more prominent part. Some strong lead guitar work punctuates the usual basic rock base. Best cuts: "Ballroom Blitz," "The 6-Teens," "Sweet F.A.," "Fox On The Run," "Into The Night." - Dan Heilman, The All-Music Guide to Rock, 1995.